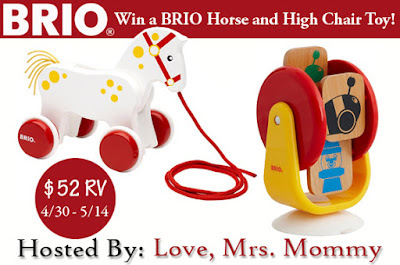 Welcome to the BRIO Horse and High Chair Toy Giveaway! Love, Mrs. Mommy is hosting a fantastic giveaway for 1 lucky person to win over $50 in toys from BRIO! BRIO makes high-quality, timeless toys that will last for years to come! Check out the review HERE! ONE (1) lucky winner will receive a BRIO Horse and High Chair Toy ($52 RV)! Contest is open to US residents only, 18+ (Giveaway ends May 14th, 2016 at 11:59pm EST). All entries unless otherwise noted are optional. Please enter the giveaway form below. Winners will have 24 hours to respond or a new winner will be chosen. Good luck! Disclosure: I received no compensation nor products for this promotion. All participating blogs are not responsible for prize fulfillment. This giveaway is not affiliated with Facebook, Pinterest, or Twitter or any other social media.